We just had a M 7.3 earthquake in northern Venezuela. Sadly, this large earthquake has the potential to be quite damaging to people and their belongings (buildings, infrastructure). 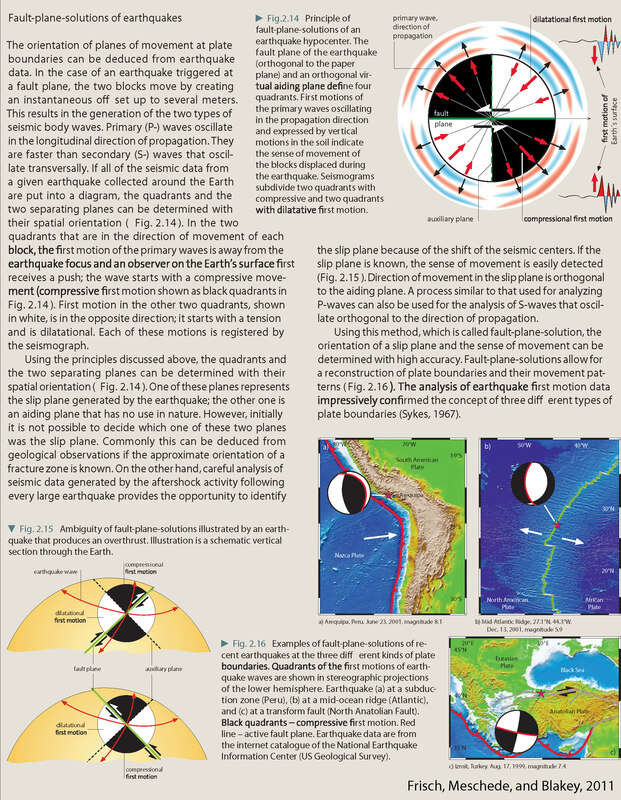 The northeastern part of Venezuela lies a large strike-slip plate boundary fault, the El Pilar fault. This fault is rather complicated as it strikes through the region. There are thrust faults and normal faults forming ocean basins and mountains along strike. Many of the earthquakes along this fault system are strike-slip earthquakes (e.g. the 1997.07.09 M 7.0 earthquake which is just to the southwest of today’s temblor. However, today’s earthquake broke my immediate expectations for strike-slip tectonics. There is a south vergent (dipping to the north) thrust fault system that strikes (is oriented) east-west along the Península de Paria, just north of highway 9, east of Carupano, Venezuela. Audenard et al. 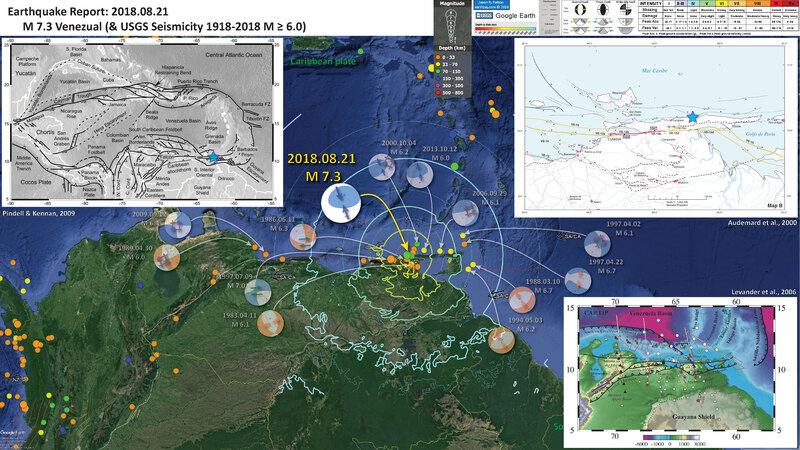 (2000, 2006) compiled a Quaternary Fault database for Venezuela, which helps us interpret today’s earthquake. I suspect that this earthquake occurred on this thrust fault system. I bet those that work in this area even know the name of this fault. However, looking at the epicenter and the location of the thrust fault, this is probably not on this thrust fault. When I initially wrote this report, the depth was much shallower. Currently, the hypocentral (3-D location) depth is 123 km, so cannot be on that thrust fault. The best alternative might be the subduction zone associated with the Lesser Antilles. GPS data support the hypothesis that the El Pilar fault is accumulating strike-slip strain, but there is a paucity of evidence that there is active convergence across the thrust fault. However, there does appear to be some small amount of contraction (Reinoza, et a.,. 2015). In the upper left corner is a map from Pindel and Kennan (2009) that shows the plate tectonic boundaries of the Caribbean and northern South America. 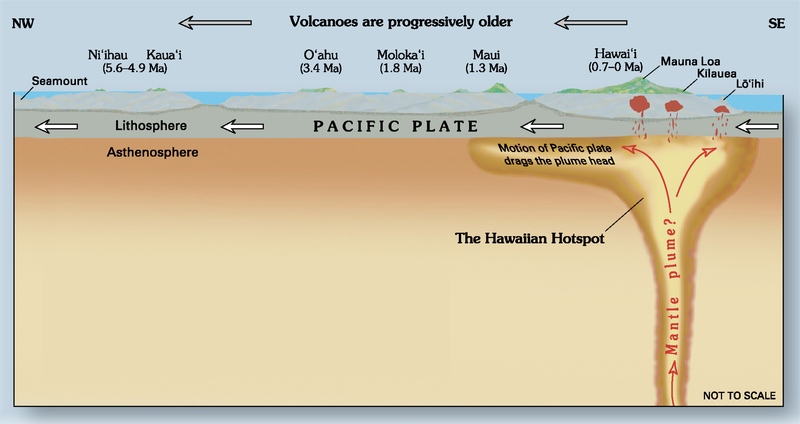 In the lower right corner is another map that shows teh regional tectonics (Levander et al., 2006). In the upper right corner is a larger scale map showing the faulting in the region surrounding today’s M 7.3 earthquake (Audenard et al., 2000). Here is the map with a month’s seismicity plotted, along with USGS earthquakes M ≥ 6.0. Here is the Pindell and Kennan (2009) map. Here is the Pindell and Kennan (2009) figure that shows how the large strike-slip plate boundary on teh north side of Venezuela grew from the west over time. Motion histories of: North (NA) and South America (SA) relative to Indo-Atlantic hot spot (IAHS) Mu¨ller et al. (1993) reference frame (grey lines; NA wrt IAHS and SA wrt IAHS); hot spots relative to North America (dashed black line; IAHS wrt NA); Caribbean relative to North America (heaviest black line; Car wrt NA), as summarized from former relative positions of the Caribbean Trench (lighter black lines). Also shown: Cayman Trough (grey outline); Cenozoic convergence between the Americas (inset upper right; P88 ¼ Pindell et al. 1988; M99 ¼ Mu¨ller et al. 1999); seismic tomographic profile of van der Hilst (1990) (inset, lower right). Here is the Audemard (2000) map showing the many faults in this region. This is a map from Reinoza et al. (2015) where they present their geodetic analysis (analysis of the deformation of the earth). These authors use GPS data to evaluate the potential activity of the El Pilar fault. Location map of the active faults in northeastern Venezuela [Audemard et al., 2000] showing distribution of the GNSS stations: yellow squares, green circles, and red triangles are GNSS sites on which the acquisition campaigns were carried out in 2003, 2005, and 2013 respectively; the blue star corresponds to the cGNSS CUMA station of REMOS-IGVSB Network. We show the epicenter location of 1929 and 1997 events with their respective proposed ruptures (orange lines) [Audemard, 2007]. (top right) The inset box shows a schematic geodynamic map of the southeastern Caribbean [Audemard, 1999b; Audemard et al., 2000; Weber et al., 2001]. Legend: BF = Boconó Fault, EPF = El Pilar Fault, OAF = Oca Ancón fault, SMBF = Santa Marta Bucaramanga Fault, and SSF = San Sebastian Fault. Here are the GPS data. The white arrows (vectors) show the observed velocities (motion rate) for the GPS sites shown on the previous map. The black arrows (vectors) show how their model results compare with the observational data. Observed velocities (white arrows) with error ellipses for 66% confidence level and simulated velocities (black arrows) according to the upgrade of displacement-simulation method. All displacements are based on the South America reference frame. Here are some cross sections showing the El Pilar fault, along with some of the thrust faults in the region. Section B is just to the west of where this M 7.3 earthquake happened. Simplified sections across the southeastern Caribbean margin (based on maps and sections by Bellizzia et al. (1976), Stéphan et al. (1980), Campos (1981), Beck (1986), Chevalier (1987); locations in Fig. 1). The 1766 eq, which could well be the predecessor of today's, was the largest one (Mw 7.8) in the CA-SA PBZ. It is interpreted as an intermediate-depth (60-200 km) eq. Pindell, J.L. and Kennan, L., 2009. Tectonic evolution of the Gulf of Mexico, Caribbean and northern South America in the mantle reference frame: an update in JAMES, K. H., LORENTE, M. A. & PINDELL, J. L. (eds) The Origin and Evolution of the Caribbean Plate. Geological Society, London, Special Publications, 328, 1–55. Reinoza, C., F. Jouanne, F. A. Audemard, M. Schmitz, and C. Beck (2015), Geodetic exploration of strain along the El Pilar Fault in northeastern Venezuela, J. Geophys. Res. Solid Earth, 120, 1993– 2013, doi:10.1002/2014JB011483.